Want a simple way to prioritize when everything seems important? Read on for the simple strategy that will help you prioritize with purpose. You know that feeling when you’ve got a to-do list is a mile long, and it feels like there just aren’t enough hours in the day to get it all done? You know, that feeling when everything seems important, and there’s absolutely no way you can possibly fit it all in? Yeah, that feeling is totally normal. Between work, family, chores, and taking care of wellness, the feeling of never-ending, never-enough, done can creep up quickly. The longer the list, the more overwhelming the whole thing starts to seem, and the less likely it is that you’ll be able to focus in and get anything done. Here’s the good news: there is a simple way to prioritize when everything seems important. The secret? 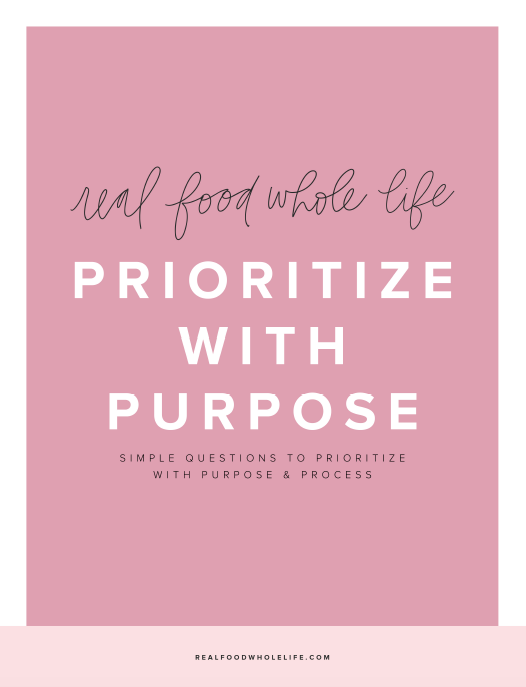 To prioritize with purpose and process. To take that crazy to-do list and run it through a filter that will allow you to prioritize what actually matters, and that will set you on a sustainable path toward your goals. It all starts by asking a simple set of questions. Here’s how it works. but first, grab the free cheatsheet to simplify prioritizing! Downlaod the free cheatsheet to help you simplify prioritization. 1. Which tasks are intentional and meaningful? Take each item on your to-do list, one-by-one, and ask yourself if doing the task has any real meaning to you. Is is something with significance, that truly matters? Is it something that’s connected to your “why,” or your overall values? If the answer is yes, then keep it one your list. If the answer is no, move onto the next question. 2. Which tasks are not intentional or meaningful? Using a critical eye, examine those items on your list that aren’t intentional or meaningful. There are often those items that you think you should do, rather than what really has meaning to you. Or there are the items related to others’ expectations or demands, but that don’t align with your life and values. Once you find these non-purposeful items, go ahead and ditch them, or at the very least, move them to the bottom of the list. 3. Which tasks help to create a sustainable path forward? Think in terms incremental forward progress here. Does the items connect to a bigger goal or plan? Is it laid out in a way that allows you to take baby steps, to create momentum, to sustain effort over time? If so, keep the item on your list! 4. Which tasks are without process? Take a close look at the items left. This is the stuff that generally fills our days. The busy work, the stuff that is more for other people than for our own values, the time wasters, the distractions. If the item isn’t leading you to where you want to be, in a way that’s incremental, then go ahead and take it off the list. 5. How can I repeat and refine? Now keep coming back to these questions again and again. Ask which items have purpose and process. Then work on prioritizing these. When you apply these questions it becomes clear that everything is not actually equally important, and that some things matter more than others. Start your day with the purpose and process items, or take them on when you have the most energy. Then be okay with letting the rest go, or at least letting them fall to to the bottom of the list. More purpose, more process, more focus on really matters.